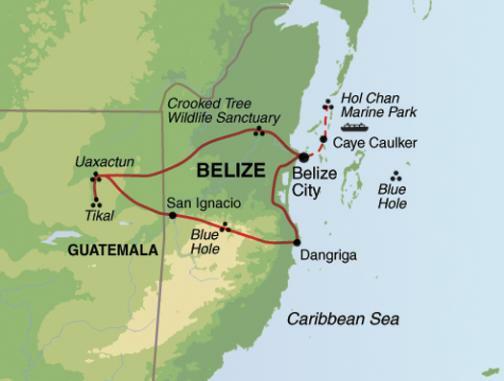 Adventures in Belize – The Great Canadian Travel Co.
Central American jungle and coast – ‘Mother Nature’s best kept secret’. Belize takes its motto to heart; no shirt, no shoes, no problem! This is a laid-back country with a lively soul. This tour also features visits to two Mayan ruins in Guatemala. Price shown in CA$, per person based on two people sharing a twin room. Single rooms are also available, please inquire for pricing. Prices vary by date, please inquire for the pricing on the tour date of your choice. Clients on the group flight will arrive in Belize City today. Land only clients should be at Belize City airport by the specified meeting time in order to join the rest of the group. Together we will transfer (approx. 1hour) to the Crooked Tree Wildlife Sanctuary, our base for the next two nights. Known for being a great destination for birds, the wildlife sanctuary gets its name from the ‘crooked’ cashew trees that grow around the lagoon. Wetland areas weave through the sanctuary, providing habitat for some 286 species of birds, the migratory Jabiru stork being the most famous of these. Crocodiles, monkeys, otters and freshwater turtles also reside in the sanctuary. It’s a peaceful destination with an interesting community and history; the village of Crooked Tree is thought to be the earliest European settlement in Belize. Wake up fresh this morning to the sound of the birds! In the morning we join a 3 hour guided boat trip on the lagoon in search of wildlife. 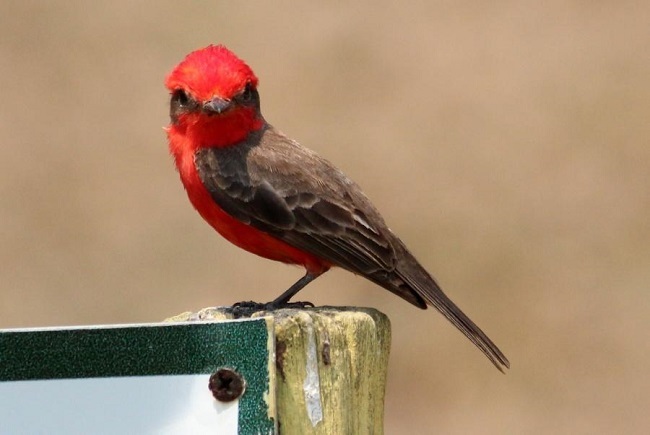 Migratory birds tend to flock to the area between December and May, but plenty of resident species can be seen throughout the year. From our small boat it’s easy to appreciate the tranquility of the sanctuary. You can then spend the afternoon at your leisure getting to know the area, or join an optional excursion to the Community Baboon Sanctuary. This grass roots project is actually a reserve for the endangered Black Howler monkey (there are no baboons in Belize but this is the name used in the local Creole dialect), providing them with 20 square miles of forest to roam freely in. It is estimated that there are now 2,000 Black Howler monkeys living in this area – you’ll certainly hear their calls as you enter the reserve! After breakfast we begin our journey (approx. 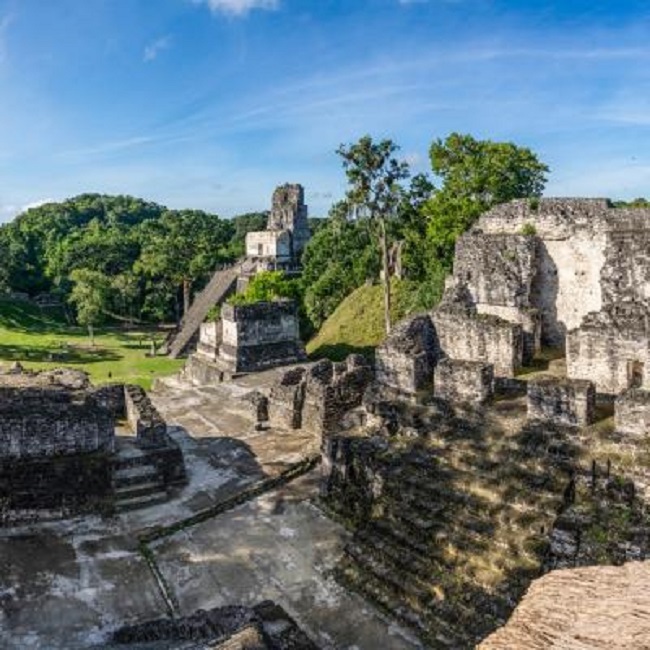 6-7 hours) to Guatemala and the archaelogical ruins of Uaxactun (pronounced wash-ak-toon), which lays within the boundaries of Tikal National Park. Uaxactun is a remote Mayan site set within 47 hectares of dense tropical forest in the lowlands of Guatemala. The alignment of the temples has been found to have important astrological connections, with the 3 smaller pyramids marking the equinox and the summer and winter solstice when sunrise strikes the large temple on these important days. In order to fully appreciate the beauty and remoteness of Uaxactun we camp overnight near the ruins. Tonight we’ll enjoy sunset at the site, after which candles will likely be lit to illuminate the ruins. The calls of Howler monkeys in the jungle canopy are likely to wake us up this morning. We start early for a sunrise tour of Uaxactun, which gives us a chance to have the site to ourselves before the park is officially open. After that we interact with the locals and tour the Uaxactun Community, where we learn about the various ways they make a living from the rainforest whilst protecting it for future generations. Many of Uaxactún’s residents nowadays make their living from gathering forest products such as chicle (gum exported to Japan), allspice and xate palm leaves (ornamental plant exported to the US and used for floral arrangements). Afterwards, we return to our campsite at Uaxactun for another chance to experience the stars! In the morning, we transfer (approx. 45 minutes) to the UNESCO World Heritage Site of Tikal. Tikal is the most famous and probably the most impressive of all Mayan sites; nearly 20 square miles of classic Mayan ruins surrounded by the dense jungles of Petén. We take a tour of the city, visiting the main temples, palaces, squares, tombs, residences and religious monuments. The area was thought to support a population of 90,000 Mayans at its peak and there are some 3,000 separate buildings to be explored. 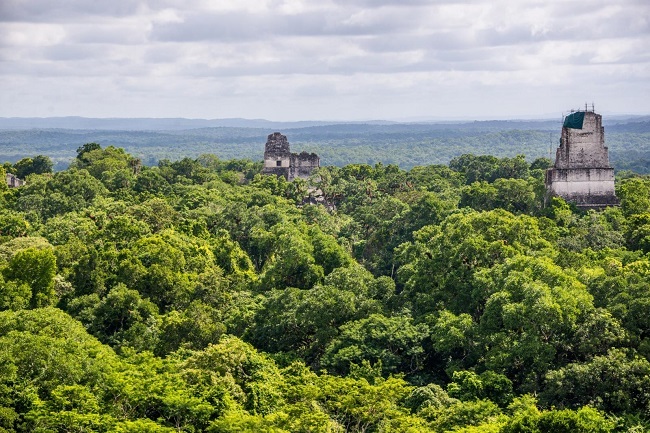 Tikal is also a superb area for observing wildlife in the jungle environment and visitors regularly see Howler monkeys, Spider monkeys, Toucans, Weaver birds, Coatimundis and even Tarantulas (if you know where to look and wish to find one!). We leave Guatemala behind this afternoon, as our journey heads back to Belize to the small town of San Ignacio. Sometimes known locally as ‘Cayo’, which means island in Spanish, the town was given this name for its location on the west bank of the Macal River. Before the arrival of roads in the area, like many small towns, San Ignacio was only accessible by boat. This laid back town, with it’s mixed population of Mestizo, Creole, Lebanese, Chinese and Mennonites, is a great example of multicultural Belize. Today we venture into the Mayan underworld at the Actun Tunichil Muknal (ATM) cave. A 45 minute journey from San Ignacio brings us to the Tapir Mountain Nature Reserve, in which the caves are located. They were discovered only very recently, in 1989, at which point archaeologists began exploring the site before officially opening it to visitors in the late 90s. The intention has been to preserve the area as much as possible; the majority of cultural artefacts found in the caves are still in their original positions and only a selected number of guides have permits to lead excursions in this area. The ATM cave was a sacred site to the Mayan people during the Classic period (AD250 – 909). They are thought to have believed that gods resided in the cave and that its chambers led directly to the underworld. Human sacrifices were conducted in the caves as a way of appeasing the gods, with the hope of creating a more fertile land. We’ll hike through sticky jungle to reach the entrance to the cave, which is partially hidden by leaves and branches but opens like a keyhole, allowing a stream to pass through the entrance. Prepare to wade or swim through water to enter the cave! Once inside, our guide will explain the history of the caves and we’ll see some of the famous artefacts that have been discovered, such as the ‘The Crystal Maiden’, the crystalised skeleton of a young woman whose bones have calcified and taken on a sparkling apperance. We leave San Ignacio behind this morning and start our journey to Dangriga. En route we will visit Maya Cocoa, a family run Cacao farm, where we will have a demonstration on the process of making chocolate, from picking the fruit through to sampling the final product! After this visit, we make a stop at the Blue Hole National Park, just off the Hummingbird Highway. 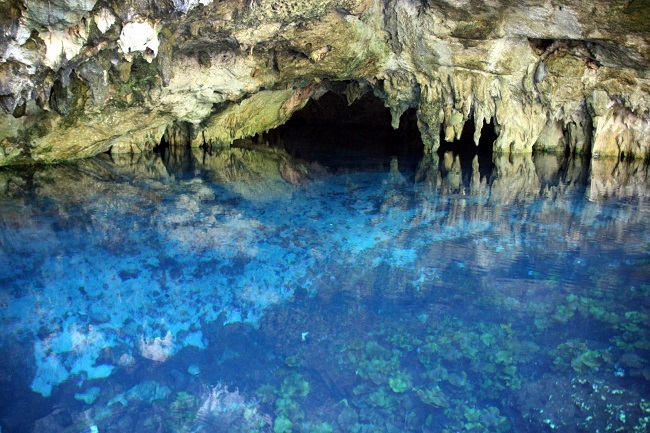 The park is famous for its large, sapphire sinkhole, which came about after the collapse of an underground river. The cool waters of the sinkhole make for a refreshing dip on a hot day! Several caves can also be found in the park and there are steps leading down to the 25ft deep pool, which is surrounded by hanging foliage and vegetation. After a refreshing swim we continue towards Dangriga, located on the southern coast of Belize at the mouth of the North Stann Creek River. Dangriga was settled before 1832 by Garinagu (Black Caribs, as they were known to the British) from Honduras, considered for years the second largest population centre in the country behind Belize City. Since the early 1980s Garífuna culture has undergone a revival, as part of which the town was renamed Dangriga, a Garífuna word meaning ‘standing waters’. Today we have a free day to enjoy Dangriga and the surrounding area. There is a choice of several optional activities today including a visit the Cockscomb Basin Wildlife Sanctuary: a nature reserve in south central Belize established to protect the forests, fauna and watersheds of an approximately 400 square kilometre area of the eastern slopes of the Maya Mountains. The reserve was founded in 1990 as the first wilderness sanctuary for the jaguar and is regarded as the premier site for jaguar preservation in the world. This morning we head to Caye Caulker or ‘Cayo Hicaco’ (in Spanish) referring to Hicaco Plum (Coco Plum) that grows in the island and was gathered by Spanish seafarers to combat scurvy. Our journey takes us to the Belize City Water Taxi Station where we take a boat towards Caye Caulker. 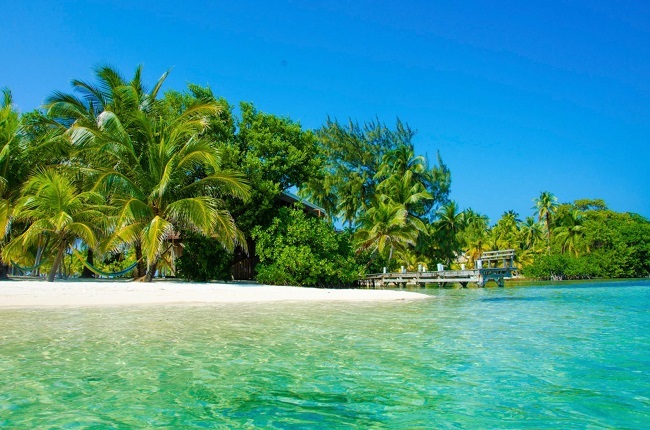 Caye Caulker is an island paradise in the Caribbean Sea. 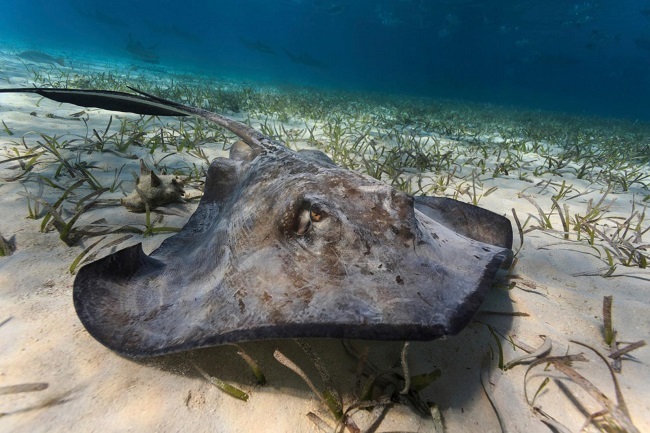 The delicate corals in the Belize Barrier Reef provide food and shelter to a dizzying number of tropical fish, with manatees, Nurse sharks, stingrays and turtles sharing the turquoise waters. Just off the southern part of Ambergris Caye, the largest island in Belize and a few minutes on a boat ride from Caye Caulker, is the Hol Chan Marine Reserve, meaning ‘Little Channel’ in Mayan as a result of a natural break in the reef. This area is now an important marine habitat providing refuge for a dizzying number of fish, coral, several species of sea turtle, the West Indian manatee and two species of dolphin. Nurse sharks also congregate in an area called ‘Shark Ray Alley’, now a popular dive site. We join a snorkeling tour in the reserve to see a selection of the marine life living in these tropical waters. Today has been left free as there are many excursions available to match different interests. 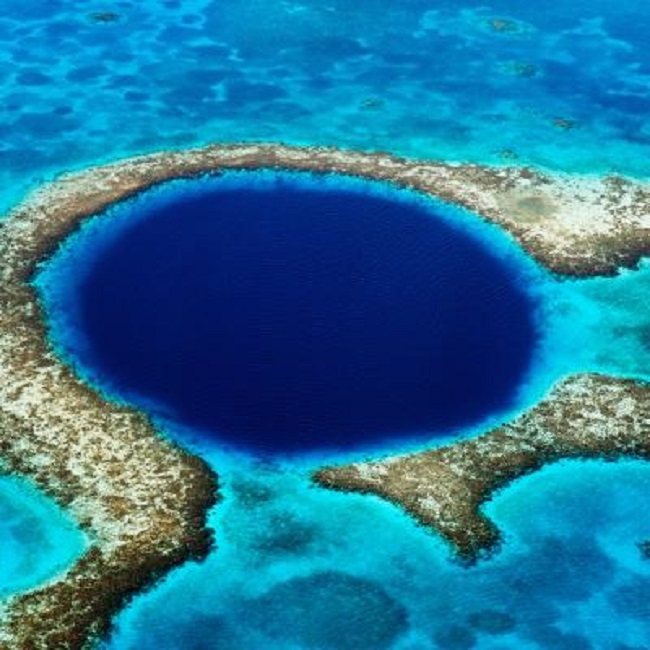 If you’re a diver we recommend taking an optional excursion to the Great Blue Hole on the Belize Barrier Reef. Not to be confused with the sinkhole located inland, the Great Blue Hole is located 60 miles out to sea within the Lighthouse Reef System. This perfectly circular limestone sinkhole drops to a depth of 124m and is fringed by coral reef, a perfect environment for divers (Jacques Cousteau declared it one of the top 10 dive sites in the world) and a UNESCO World Heritage Site. Please note that you will have to add an extra night’s accommodation on to the end of your trip if you plan on going scuba diving, as you cannot fly for 24 hours after diving. This morning we wave goodbye to our island paradise and return to Belize City by water taxi. Your tour ends in Belize City. On this action-packed adventure we visit a ‘Mayan underworld’ cave system, swim in sapphire sinkholes and don snorkels to discover a myriad of underwater colour – manatees, Nurse sharks, stingrays and turtles share the turquoise water. We also cross into Guatemala to visit two important Mayan ruins, Tikal and Uaxactun. Please note, the order of the tour components was correct at the time of publishing but may change due to local conditions. Every attempt will be made to run the tour as outlined but some changes may be unavoidable. This is an active trip. It is suitable for those with a spirit of adventure, however the pace is manageable and the included activities are suitable for beginners if you have no experience of them already (e.g caving, snorkelling). In order to visit a number of areas of natural beauty, some long drives are necessary, sometimes across bumpy roads. We will also travel by boat to and from Caye Caulker. Please be aware that border crossings can sometimes be delayed with significant queues and formalities. Being in the tropics, most of the region is hot and humid, particularly during the summer months and inland – drinking plenty of water and dressing in loose cotton clothing will help.